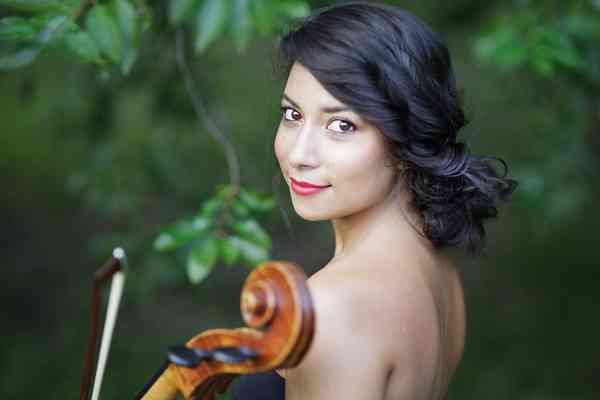 Cellist Melody Giron was born and raised in Boston, Massachusetts. She began her musical studies at age four at the New England Conservatory of Music Preparatory School where she studied cello and voice. Melody gave her debut solo performance at the age of ten at the Commander’s Mansion in in Watertown, MA. She has since performed in concert halls in China, Europe, South America, Central America and the United States with orchestras, chamber groups, and as a soloist. Performances include venues such as Carnegie Hall (New York), Symphony Hall (Boston, MA), Jordan hall (Boston, MA) Snape Maltings Concert Hall (Aldeburgh, England),Radio City Music Hall (New York), and Madison Square Garden (New York)among others. Melody currently resides in New York City where she is actively engaged in a variety of solo and ensemble work as well as teaching. In NYC Melody is principal chair of the Metro Chamber Orchestra and performs with The Chamber Orchestra of New York. Melody also plays guest principal chair of The Huntsville Symphony Orchestra in Huntsville, Alabama, and subs with the Rhode Island Philharmonic. Melody’s versatility and passion for working on new music recently engaged her in the May 2018 world premiered Julia Wolfe’s SPINNING for three cellos and voice as well as Ted Hearne’s world premiere of “PLACE” in October 2018 at Brooklyn Academy of Music. In 2017 Melody’s was invited to solo grammy-nominated composer David Chesky’s “Arbeit Macht Frei” for solo cello and orchestra. In the summer,she also soloed with the Metro Chamber orchestra performing Bloch’s “Prayer from Jewish Life” for a veteran’s memorial concert . Other recent performances include a private quartet concert for Saudi Arabia’s Crown Prince, Mohammad bin Salman during his April 2018 visit to NYC. She also recently performed at the Governor’s Ball NYC 2018 with Eminem, 50 Cent, and Skylar Grey.She performed with R&B star Keyshia Cole, at the Prudential Center in New Jersey and performed for crowds of over 35,000 people with Stevie Wonder,in his Songs in the Key of Life Tour which included venues such as New Jersey’s Prudential Center and New York City’s Madison Square Garden. Andra Day and Ed Sheeran were among Stevie’s guest performers on tour. In 2016-2017 Melody starred in the GMC Acadia car commercial, airing nationally on television. In the Spring of 2016, Melody was chosen by playwright, Edward Albee, to act the role of “The Musician”in the Off-Broadway production of The Sandboxdirected by Lila Neugebauer at Signature Theatre Company in NYC.Melody also appeared on TV as a member of the string ensemble for NBC’s America’s Got Talent season 10 and can be seen performing on Amazon’s TV series, Mozart In The Jungle Season 2 and filmed Season 4 this past summer. Melody is currently playing cello for Bard SummerScape’s revival production of Leonard Bernstein’s Peter Pan directed by Chris Alden. In December of 2015, Giron was invited to perform as part of renowned pianist and Irish music producer, Phil Coulter’s Twilight Christmas String Quartet. While on tour with Coulter, Giron performed for former President Bill Clinton and former Secretary of State, Hilary Clinton at Carnegie Hall. In the summer of 2014, Melody was invited to perform for Boston Guitarfest’s “Emerging Artist Concert” at New England Conservatory’s Jordan Hall. Melody’s summer festival engagements include, The Britten-Pears Young Artiste Programme in Aldebrugh, England. She performed for the widely proclaimed production of Benjamin Britten’s opera, Peter Grimes in 2013 and returned in 2016 to perform for the “Tchaikovsky Project” under the baton of Semyon Bychkov. In 2013, Melody played principal cello in the Penderecki Academy Orchestra of Westfalen, Germany as well as the Luslawice Academy Orchestra of Poland under the direction of Krzysztof Penderecki.In 2012, Giron attended the International Holland Music Sessions, culminating a solo recital at Ruinkerk in Bergen, Netherlands. Melody was also a member of the Aims in Graz Orchestra, in Austria, where she was assistant principal cellist to Mimi Mcshane of the Dallas Symphony Orchestra in 2011 . Later that same summer, Giron was invited to perform Saint-Saens’ The Swan with the orchestra of the Sienna Summer Music Festival in Italy. While attending the Peabody Conservatory of Music for her master’s degree, Giron’s string trio was invited to perform in a master class with Takacs Quartet and Elma Oliviero. Trio Vivre was also invited to perform in the “Thursday Noon Recital Series” for which Peabody Conservatory faculty selects their most advanced performers. Giron was also invited to play as a soloist for the conservatory’s “Thursday Noon Recital Series” in 2014. Melody has worked with prominent artists and teachers such as the Takacs Quartet, the Peabody Trio, The Borromeo String Quartet, Vivian Weilerstein, James Buswell, Lucy Chapman, John Heiss, Ran Blake, Benjamin Zander, and Hugh Wolff. Her summer studies have been with renowned pedagogues, Eloenore Schoenfeld, Orlando Cole, Metta Watts, Dmitri Ferschtman, and Rienhard Latzko. In 2011, Melody collaborated with renowned pianist/harpsichordist John Gibbons for her senior recital at New England Conservatory. Committed and passionate about teaching and pedagogy, Giron completed the two year Suzuki Method teacher training program at the School For Strings in Manhattan, New York under the tutelage of Pamela Devenport. Giron holds a private studio of over a dozen students in addition to teaching at Diller-Quaile School of Music,Tone Academy of Music and Hunter College Elementary School in New York City. Melody earned her bachelor’s degree in cello performance from The New England Conservatory of Music in Boston, MA under the tutelage of Natasha Brofsky. She earned her master’s degree in cello performance from the Peabody Institute of the Johns Hopkins University in Baltimore, MD, at which she studied with Alan Stepansky.